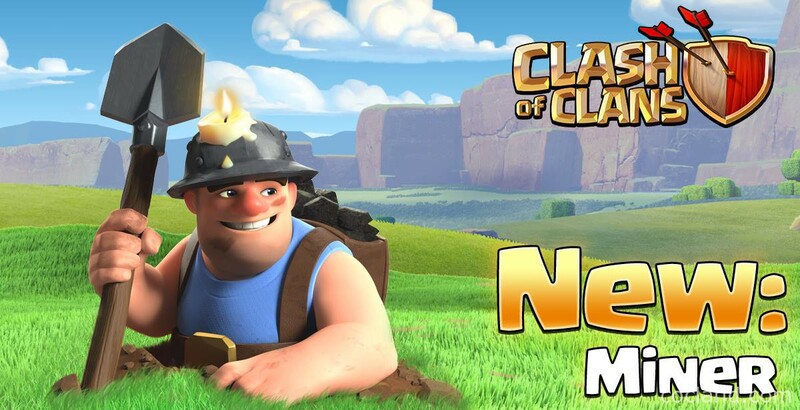 Okay guys so finally Supercell has revealed the next new Clash of Clans Troop in the upcoming May Update – The Miner! Let’s take a look and see what we got today about this new guy! The Miner easily burrows underground, bypasses beneath walls and pops up right next to the target. Obviously, nothing can target him while he is digging underground. Every time after destroying a target, he burrows underground again and get to the next target. Because of this, he doesn’t trigger any trap while he is underground. He does trigger traps when he is on the ground, stands next to the target. He is unlocked at Town Hall 10 and he is Elixir Troop. He takes 5 housing spaces and takes 5 minutes to train. He is also pretty cheap, just about 4200 . There are 4 levels in total. The Miner has no favorite target. Miners are affected by Spells even when they are underground. It seems like pretty cool do get your Super Queen inside and then use the Miners. They will become real monsters! What do you think about the Miner in this new update guys? Please share your opinions!